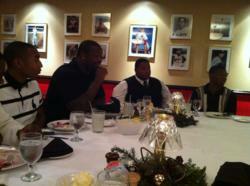 Langford, defensive tackle for the Rams, took members of Gateway Institute of Technology's football team to dinner as a reward for their accomplishments, on and off the field. Rams' DT Kendall Langford with students athletes at high school mentoring dinner. I just wanted them to know that I’m human just like anybody else; it just comes down to hard work and effort. If they always give it their all in life, they’ll always come out successful. Senior members of Gateway Tech’s football team joined Rams’ defensive tackle, Kendall Langford for his inaugural First Line of Defense dinner at Mike Shannon’s Steak & Seafood. St. Louis-based Fun Tyme Limo and Mike Shannon’s Steak & Seafood partnered with Kendall to give the group a truly outstanding evening. The festive occasion started with roundtrip transportation in Fun Tyme’s luxury, stretch SUV for the group of 12. Upon arrival at Shannon’s, Kendall greeted the group in a private dining room where Executive Chef Nick Zotos had customized a meal that highlighted the best of Shannon’s extensive menu. He wanted to guarantee that the choices, which included tenderloin filet and seared salmon, provided the group with an authentic knowledge of fine dining. Kendall’s mission was to use the dinner as an opportunity for positive reinforcement mentoring and to encourage the attendees as they prepare to transition from high school. During dinner, the group had the chance to get to know Kendall in a relaxed and candid atmosphere. Though the group discussed many topics, they honed in on football, Kendall’s journey to the NFL and life in general. Langford, a native of Petersburg, VA is in his first year with the Rams and fourth year in the league. Since entering the NFL, he has made being involved in the community a priority, from distributing turkeys for Thanksgiving in his hometown to his annual free youth camps for high school students.